I planted two different ferns on the northside of our screened porch earlier this Summer. That post with the full details can be found here in the garden diary. One of them (Autumn Fern) was planted on the left of this transplanted hosta and one of them (Japanese Painted Fern) was planted on the right. If you look back at the post when I planted these, the hosta in the middle wasn't there yet and we didn't even have our mulch for the season, so I planted these in some clay. They both immediately sufferend. Dried out. Figured they were dead. Only thing I lost was the two bucks apiece, I figured. Well, on a recent walk around the screened porch, what did I discover? That both of these ferns have made a comeback of sorts! 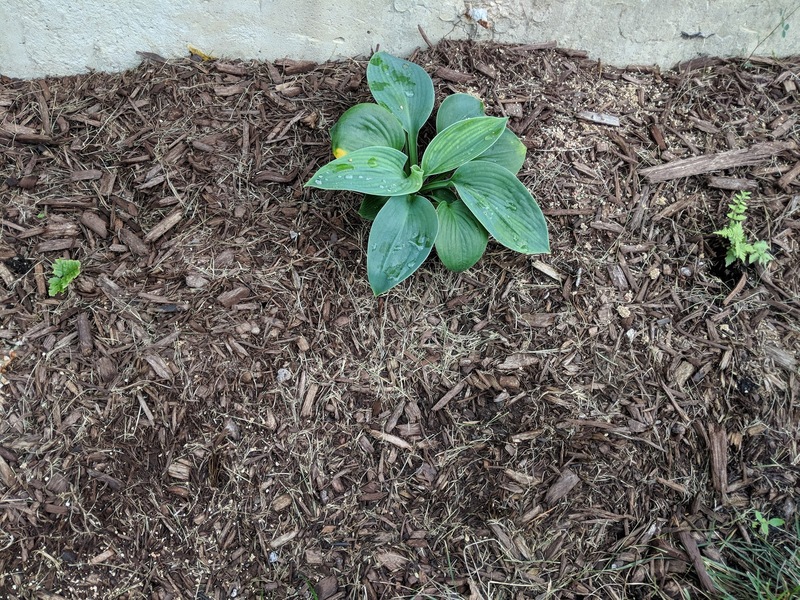 They're both green, and have shoots popping through the mulch. Amazing! You can see their little beings on the far sides of this photo. Incredible, right?? Well, maybe not to you, but this is an incredible sight to me. Hey...thanks, Audrey Hepburn! Now that I know that these are coming back, I'm going to give them a little bit of late-season love with some water and then hope for the best that after laying dormant (what I thought was dead!) most of the Summer, they were busy establishing themselves out of the eye of the hot sun. And who knows? Maybe next Spring we'll see them jump through the mulch and show their feathery goods for the world to see! Ferns (at least the Ostrich variety) are a hearty bunch. So, maybe these will make it after all!